In the past, I posted about Van der Gang watches, a Dutch watch brand that gains in popularity here in The Netherlands, but is too much inspired on the IWC Portugieser watches. A shame, because if you can produce quality watches like those, you might want to spend extra money on your own design department as well. Anyway, besides Van der Gang watches, there is another watch brand in The Netherlands, which is there for quite some time now, but never got much attention on this blog. 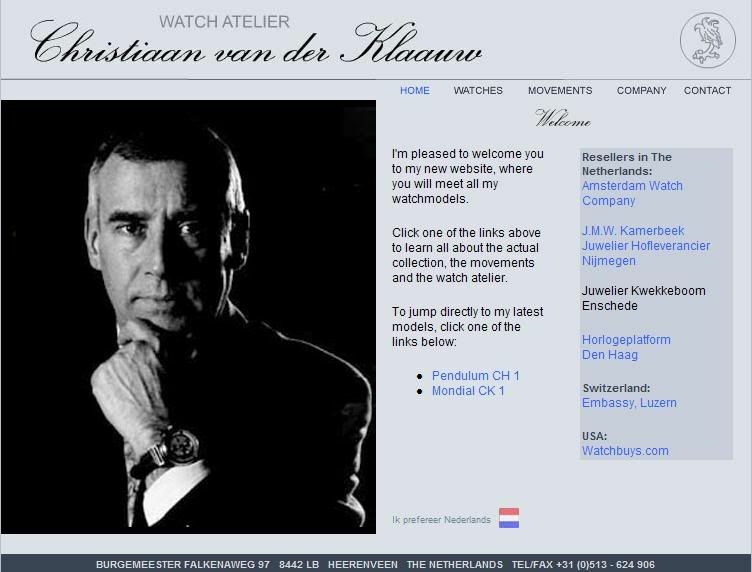 I am, ofcourse, talking about Christiaan van der Klaauw watches. Christiaan van der Klaauw is a watch maker in the northen part of The Netherlands, which is famous for its clocks (Frysian). Christiaan van der Klaauw started as a clock maker as well, but also started making wrist watches. Personally, I am not very attracted to its design, but at least it is original and very nicely finished. Check out his website and look at the watch animations (per model!) on your screen. If you are into classic watches, with very nice complications, it might be something for you! Because the number of watches Christiaan van der Klaauw makes every year is quite limited, it is possible to have your watch customized a bit. Click on http://www.klaauwwatches.nl/ for the (also available in English) website.